I'm really proud to announce that myself, Flying With Anna and Tim at The Blue Walrus have got together with the help of a splendid chap called Matt to put on a blogger curated night at London's Dingwalls venue on May 19th. 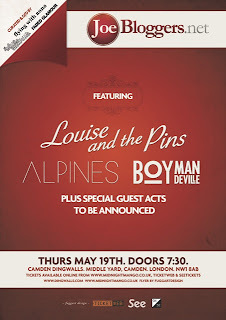 The gig will be headlined by Louise & The Pins and FG faves Alpines, Daughter AND Boy Mandeville will all be appearing. There's even one more act to come! Bearing in mind the last gig I was involved with putting on was six years ago - featuring the oft-ridiculous Les Incompetents, two of whom are now in the hotly tipped Spector - it was brilliant to be invited to be part of this. And even better that some of my favourite bands of late are playing too. Check out my previous posts on Boy Mandeville, Alpines, and Daughter. I'm definitely looking forward to checking out Louise & The Pins, who made it to the last 8 of this year's Glastonbury Emerging Talent Comp, which I was also involved in. More details can be found at JoeBloggers.net and when the full line-up is announced, I'll run you through all the bands properly. Tickets for the gig are just £6 in advance. For FIVE bands. Deal or no deal?